Russian embroidery artist Krista Decor hand stitches her designs onto tulle—a fine net-like fabric with a shimmering, translucent quality that makes her designs look as though they are floating in mid-air. Krista first learned to make “real haute couture embroidery” using tulle when she collaborated with designers during an internship at V. Yudashkin—a fashion-house in Russia. 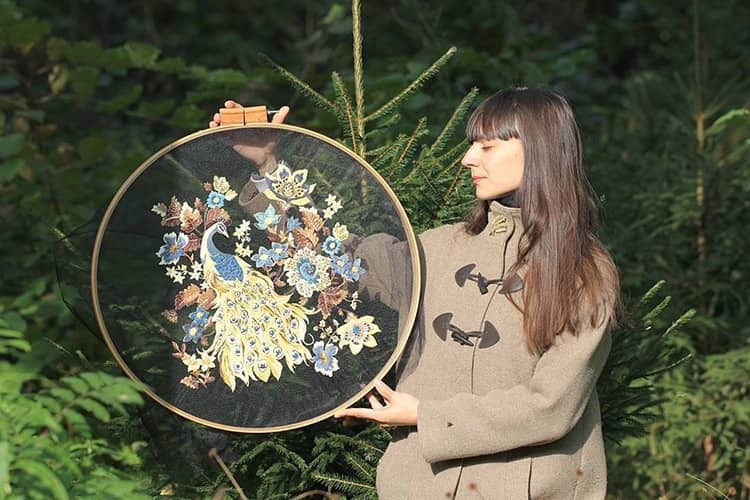 Since then, the artist has been creating exquisite, nature-inspired embroidery designs, with flowers, leaves, and birds as her primary motifs. Krista mostly uses colorful cotton and wool embroidery threads of various thicknesses and textures; however, she also embellishes her designs using silk ribbon, beads, pearls, and natural stones, which add a touch of dazzling luxury to each piece. Krista often updates her Instagram page with new designs, as well as progress shots and videos. Embroidery artist Krista Decor stitches her designs onto see-through tulle fabric. Autumn leaves appear to float in the embroidery hoop. Japanese cranes fly among cherry blossom trees. She also uses metallic yarn and beads to embellish her designs. All images via Krista Decor. The post Ethereal Embroidery Designs Stitched into Tulle Look Like They’re Floating in Mid-Air appeared first on My Modern Met.